The Yacht Racing Association was organized in November of this year by Count Edmund Batthyany, Captain Hughes, and Mr. Dixon Kemp. Its object was to systematize yacht-racing and to improve it. 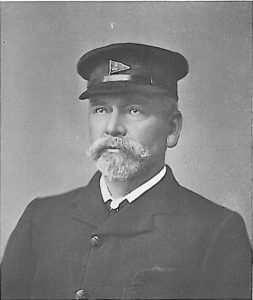 The following yachtsmen were present at the first meeting: The Marquis of Exeter, Count Batthyany, Colonel Dugmore, Colonel Leach, Major Ewing, Captain Hughes, Captain Gill, Messrs. W. B. Forwood, Cecil Long, C. E. Robinson, W Baden-Powell, Henry Crawford, J. S. Abbott-Dunbar, T. W. Blake, E. Rushton, W. W. Hughes, H. C. Fox, E. Boutcher, J. A. Hankey, J. F. Starkey, C. Weguelin, George Duppa, G. B. Thompson, E. H. Bentall, John R. Kirby, J. N. Palmer, John Richardson, H. Bridson, David Finlay, W. C. Quilter, William Turner, Edward Packard, Frank Willan, Harry Taylor, J. M. Hannay, and H. S. Baillie. The Marquis of Exeter was elected president. New vessels this year were: Cuckoo, cutter, 93 tons, built by Fife for Mr. H. Hall; Olga, schooner, 217 tons, built by Hender­son for Mr. J. A. Hankey; Neptune, yawl, 50 tons, built by Fife for Mr. N. B. Stewart; Vol-au-Vent, cutter, 102 tons, built by Ratsey for Colonel Markham; Latona, yawl, 161 tons, built by White for Mr. A. B. Rowley; Hypatia, cutter, 45 tons, built by Payne for Mr. W. Gordon; Veronica, cutter, 85 tons, built by Ridgway for Mr. T. G. Freke; Coralie, cutter, 40 tons, built by Hatcher for Sir F. Gooch; Shulah, 20 tons, built by Fay and Son for Mr. Pascoe French; Thyra, 20 tons, built by Fife for Mr. J. Lilburn; Ivanhoe, 20 tons, built by Dickinson for Mr. F. Thompson; and Hinda, 20 tons, Mr. G. B. Thompson, from his own design. Corinne was the chief prize-winner of the schooners, Gwendolin and Egeria being fairly successful also. The last named won both schooner matches on the Thames. Florinda was once more champion of the yawls, with the new Neptune next. Neptune, ex Miriam, ex Neptune, ex Zampa, 50 tons. Messrs. P. E. Perquez and G. Palyart. Designed as a Cutter by Mr. W. Fife, Sen. in 1875.
wind and had to beat in. Only four vessels started, Vol-au-Vent taking the Cup. The old Arrow sailed famously, however. Only one other Queen’s Cup was presented this year – to the Royal Cinque Ports Yacht Club – and it was won by Corinne in the match to Boulogne and back. This was distinctly a ‘Fife year,’ for, represented by Cythera, Cuckoo, Neva, Neptune, Surf, Bloodhound, Fairlie, and Pearl, he was far ahead of other designers, his boats winning sixty-four prizes. Fiona had eight first prizes, Cythera seven, and Cuckoo and Vol-au-­Vent five each. Bloodhound was crack of the ‘forties,’ with Norman next. Britannia was not in such good form as in the year before. Of the ‘twenties,’ Vanessa was by far the best. She won seventeen first prizes and five second. She met Quickstep this season, and easily defeated her. The class was very strong, with Thyra, Maggie, Quickstep, Hinda, Playmate, Sunshine, Zampa, Shulah, Ivanhoe, and Vanessa racing together on the Clyde, and Penelope, Fleetwing, Nadejda, Vanessa, and Thought in the South. A very smart new 10-tonner, Lily, was designed by Mr. A. Richardson for Mr. J. Leitch. She had a larger amount of lead on the keel than was usual up to this time. Queta (Mr. W. G. Jameson) was also another very smart 10-tonner of the year. It is interesting to note that handicap racing was tried in this year by the Royal Alfred, Royal Victoria, the Prince of Wales’s, and Junior Thames Yacht Clubs. Although the chaotic system of classification in vogue might amply excuse this procedure, it was roundly condemned by many at the time. This was a busy, but not very interesting season. Kriemhilda, Cythera, Cetonia, Gwendolin, and Sea Belle did not race, and Corinne only joined in the middle of the season. When she did appear, however, her success was remarkable. Neva won twelve first prizes, totalling £985, although she had bad luck. In her first race on the Thames she was fouled by Iona, and lost her bowsprit, and in the Royal Victoria Regatta she got ashore, breaking her gaff, topmast, crosstrees, and spinnaker boom, when she seemed certain to win. Her keel was badly injured on this occasion, but the damage was not discovered for some time, when her inferior form led to an examination, Next to her was Vol-au-Vent, which won six first prizes. On the Thames she was beaten by Fiona on the first day, and by Neva on the second, but she won at Harwich. Cuckoo beat her in the up-Swin match and from the Nore to Dover, whilst she had to give up at Dover. She won the match to Boulogne and back, however. She would have won the Squadron Queen’s Cup had she not been disqualified for going on the wrong side of the ‘Prince Consort’ buoy, letting Raven win the prize. The old Arrow beat her on the next day, but at Ryde she won two first prizes. Cuckoo only once beat Neva – at the Royal Ulster Regatta – though she lost a race from her by one second only on the Clyde. 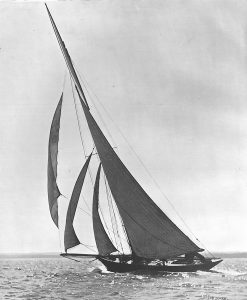 Neptune had a cutter as well as a yawl rig, but as a cutter she only won one prize, and that was against Hypatia and the ‘forties’. Egeria was the most successful schooner of the year. 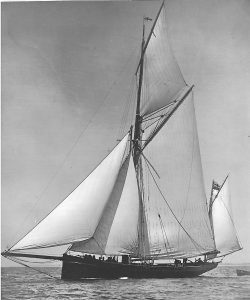 Hilde­garde, a new schooner of 198 tons, built by Nicholson for H.R.H. the Prince of Wales, won the Cowes Town Cup. Olga was the most unfortunate vessel of the season. She won the match at Harwich, but was disqualified for not carrying her anchor catted. At Dover she won the race to Boulogne and back with the utmost ease in 4 hours 50 seconds, and at Bangor she beat Egeria handsomely. At Rothesay she was unable to start when the weather just suited her; at Cowes she sprung her gaff, which lost her the race; and at Torquay she came to grief when leading Corinne. Corinne did not race until after the Havre Regatta, and she did not start at Falmouth, Plymouth, or Cowes. She won at Southampton, but did nothing at Ryde. She won the schooner race at Southsea, and from that on she was very successful. Myosotis was head of the 40-ton class, and won the Albert Cup. Bloodhound was almost equal to her, and would have been so but for losing a race by stopping to pick up a man overboard. She seemed out of form in the early part of the year, and won nothing until she came to Kingstown. Norman was late in fitting out, and did not race until the Clyde Regattas. She sailed so well, however, when she did join that she may really be considered the crack boat of the class this year. Coralie and Britannia were disappointing. Thane, Ellida, and Christine were new vessels, but unsuccessful. 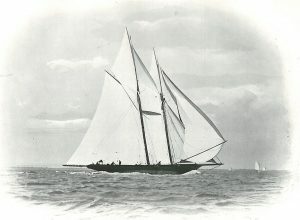 Challenge, a new 20-tonner, built by Sherlock for Mr. F. Thompson, was the crack of her class. She did not meet Vanessa, however, or the result might have been different. 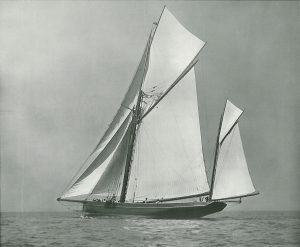 Butterfly, built by Stow for Mr. J. F. G. Williams, was another new twenty meeting with considerable success. Shulahwas the next best vessel to Challenge, whilst Vanessa seemed to have fallen off. Moira, a new iron vessel built by Mr. J. Inglis for himself, showed good promise at times. Dudu was the best 15-tonner in the South, and Fairlie in the North. The two did not meet, however, during the season. 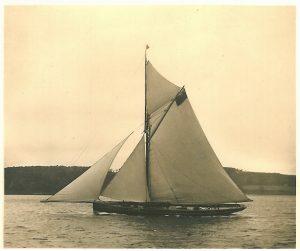 The new 10-ton Florence, Mr. R. Y. Richardson, was the crack of her class, but Lily was not racing. Florence was beaten by Gondola at Bangor and Kingstown, and by Queta in the Royal Alfred match. Queta had the next best record. 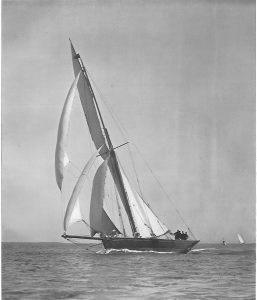 Freda, a new Hatcher, 5-tonner, owned by Mr. T. G. Freke, made a great name for herself in the South, and in the North the class boasted the well-remembered names of Vril, built by G. L. Watson for J. W. Lawrence, and Clio, built for himself by Mr. W. Fife. The class was excellent with Clotilde, Camellia, and Wee Pet also competing. Clio and Vril were the pick of the lot, but it was difficult to choose between the two. The season practically opened with a most interesting series of matches between the three noted 5-tonners, Freda, Vril, and Camellia. 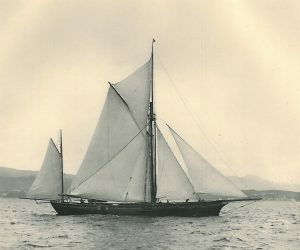 Freda was the crack boat of the South, and a series of races was arranged between her and the Watson flier Vril, and also a similar series with Camellia, a Fife production. The matches took place early in May on the Mersey, and produced a greater amount of interest, probably, than any other races between boats of these dimensions. On the first occasion of meeting there was a topsail breeze, and Vril was winner by 5 minutes 30 seconds. On the second day the conditions were very different. There was a strong wind and a heavy sea. Both boats were reefed, and the result of the race was a win for Freda by 5 minutes 15 seconds. The third was another hard-weather trial, and victory rested with Freda by 55 seconds, and she thus won the series. It was then Camellia’s turn to oppose Freda. The Southern boat had proved her superiority in heavy weather, and this was likewise Camellia’s strong point. The matches followed immediately on those with Vril. The weather had, however, undergone another change. The breeze was light on the two first days, and both races fell to Freda by 1 minute 41 seconds and 1 minute 50 seconds respectively. The concluding race was sailed in a very hard wind. Camellia gave up, and thus the contest ended in a victory for Freda. The summer, on the whole, was a most boisterous one, and in some few instances the regattas suffered in consequence – more particularly Weymouth, and also Falmouth, which several yachts were unable to reach from Kingstown, owing to having to make the passage in the teeth of a south-westerly gale. It proved a most destructive year for masts and spars generally. There was a very full list of regattas, and it looked at one time as though there would be a considerable amount of clashing between different clubs. This was avoided by some alterations in the dates of a few of the regattas, though the Royal Cork Club suffered through clashing with the matches at Dover. Miranda. In 1882, when owned by Mr. Lampson. There was a good muster of big schooners, although one or two well-known names were missing from the regatta programmes. The most notable absentee was Mr. Mulholland’s Egeria. Miranda, a vessel that had been built in the previous year, but which had not raced, had been under a thorough overhaul during the winter. Every care was taken that she should come out in as perfect condition as possible, and her meeting with Corinne and some of the others of the two-sticker fleet was looked forward to with interest. Corinne had also had a complete overhaul during the winter, and came out with new canvas. There was some grand racing among these big craft. Miranda quite fulfilled the expectations which had been formed of her, and came out at the top of the class with a far bigger list of wins than any of her competitors of the same rig. Her record for the season was ten prizes of the total value of £540, Corinne being next with six prizes, totalling in value £295. Australia, the biggest of the fleet, had three prizes to her credit, all firsts; while the Sea Belle had the like number, only one of which, however, was a first. 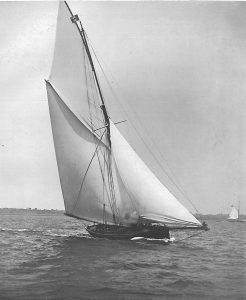 Hildegarde, the Prince of Wales’s schooner, scored one victory, that being in the race for the Queen’s Cup at the Squadron Regatta; while Columbine, the smallest of those sailing regularly, had likewise one flag at the end of the season. There were no new craft among the cutters, but there was some very keen racing among those that were out. The old Lulworth was in commission again, but she did not figure in the list of prize-winners. The classes which did the round of the principal regattas were the vessels over 40 tons, those not exceeding 40, and those not over 20 tons. Neva had changed owners since the preceding season, but her new owner had retained her last year’s skipper and crew, so that there was every chance of her giving a good account of herself, although it was generally recognised that she would have a harder task set her than in the previous year, and it was hardly expected that she would again head the class in the number of prizes won. That, as the smallest boat of the regular racing division, she should have done so in a season remarkable for hard winds speaks volumes alike for her powers and the manner in which she was handled. She had the best record of any yacht at the end of the season. With nineteen prizes, her total value of winnings amounted to £1,354. Vol-au-Vent was next, but a long way behind; she had nine flags, and the value of her prizes was £550. Cythera had only four prizes, but they included the Queen’s Cup at the Royal Irish Regatta. Psyche took one first during the year, and Kriemhilda one second. 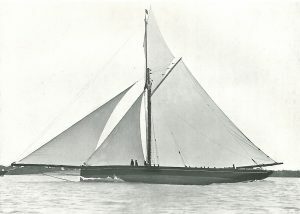 Some great expectations had been formed of Veronica, which had been transformed almost into a new vessel at Hatcher’s yard during the winter; but her performances at the earlier matches were dis­appointing, and later in the season we find her transformed into a yawl, a rig becoming much more favoured. A new 40-tonner had been built by Fife; but she was not built to order, and did not find an owner for this season. Mr. Macmaster’s Myosotis headed this class with ten first and four second prizes, of the total value of £776. One of her early matches – the Royal Thames – she probably lost through her skipper falling overboard. The Marquis of Ailsa’s Bloodhound and Major Ewing’s Norman made a very close fight of it for second place in the season’s record. The former had a total of twelve prizes, and Norman eleven. Britannia’s record was eight, and Coralie scored seven flags. Christine, Niobe, and Thane completed the fleet of 40-tonners as far as the most regular competitors were concerned. Quickstep, 20-tonner. Designed, built and raced by Mr. David Fulton in 1872. There were several additions to the already very large fleet of 20-tonners, the most notable, as after-events proved, being Enriqueta, built by Hatcher for Mr. Jameson. She came out at the end of the season with the best record in her class, winning fourteen first and four second prizes, of the total value of £348. Vanessa was next, with twelve firsts and two seconds, then last year’s crack, Challenge, with eleven firsts and four seconds. Quickstep secured five firsts and one second, and Frederica, a new craft by Harris for Mr. Pochin, three firsts and one second. Jullanar, Yawl, 126 tons. Designed and built by Mr. E.H. Bentall in 1875. Camellia, Cutter. Mr. R. Rannoch Stewart. value £553. Jullanar’s record was twelve flags, value £795. Cuckoo had been converted to yawl rig, and scored seven prizes during the season, and later in the year we find both Fiona and Veronica with mizens. Fleur-de-lys, Lufra, Rosabelle, Sea Belle, Surf; Raven, Ada, and Belladonna were amongst the vessels that sailed more or less regularly in the class. Fairlie was at the top of the 15-tonners, which, however, did not form a very strong class. The 10-tonners were in fair numbers on the Clyde, and were also increasing in numbers on the Thames. Florence again headed the class with twenty-three prizes. 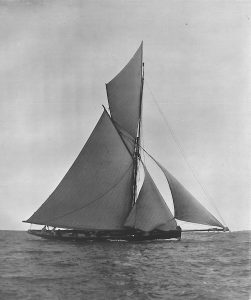 Camellia, the 5-tonner which sailed in the special matches at Holyhead at the beginning of the season, had a much fuller season’s racing than either of her competitors on that occasion, and finished the summer with twenty-one flags. Vril during the year took six firsts and one second, and Freda four firsts. In the early part of the year there were many misgivings as to the racing prospects in the approaching season. Fortunately, matters turned out much better than at one time appeared likely, and although the season may not be regarded as specially brilliant, yet it was fairly up to the average of those immediately preceding it. The schooner class certainly seemed doomed. The sport amongst the two-stickers had not been considered to be up to the average in the preceding year, but it was much less interesting this year. The reason was to be looked for in a large measure to Miranda’s success. She had demonstrated her superiority to that extent that she had practically spoiled the class. So far as the weather was concerned there was little to be desired. It was quite different to that which had been experienced in the preceding year. There was a succession of moderate breezes throughout the summer, and if we except, perhaps, the regatta at Dover, which was spoiled in a great measure for want of wind, all the principal matches of the year were sailed in fairly true winds. This was especially the case in the Solent, when there was a continuance of moderate true breezes for the three weeks over which the regattas extended. Taking the classes in their order, we may treat of the schooners first, as being the biggest vessels. As already stated, Miranda had apparently spoiled the class. At the river matches of the Royal Thames Club, Egeria, which was in commission again, was entered for the schooner race with Corinne and Miranda. Miranda was, however, the only one of the trio that hoisted racing colours, and, as a sail over was not permitted, the race fell through. This fiasco created a deal of comment at the time. In the Nore to Dover race there were three schooners, Miranda, Australia, and Egeria. There was a total entry of sixteen vessels, and Miranda took the third prize on time. Corinne met and beat Miranda in the Solent on one occasion after a very keen race, but suffered defeat in the only two other races which she sailed this year. This was the only occasion during the season upon which Miranda was beaten by a vessel of her own rig. For lack of regular competitors amongst the two-stickers, she sailed many of her races in mixed classes. She took fourteen prizes in all, of the value of £665. Hildegarde’s record was one first, won in a private race against Aline round the Isle of Wight, and one third, which was the result of a protest against Miranda at Weymouth. 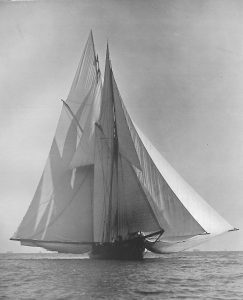 The American schooner Enchantress took part in the racing at Cowes, and the other schooners sailing occasionally were Australia, Amy, Avoset, Wild Swan, Oriana, and Nada. The yawls formed a particularly strong class, and provided some of the best racing of the season. The excitement which Jullanar’s appearance had created last year had by no means abated, and she further enhanced her reputation by coming out at the head, not only of the yawls, but with the best record of any yacht of the year. Her almost phenomenal success of the pre­ceding year had directed attention to her design, which had hitherto been considered curious, to say the least, while there were still a few who at the beginning of the season were disposed to detract from the value of her performances, and, when they could say nothing else, would refer to her as passing everything afloat in ugliness. Her best performances were in hard winds, but she had always to be reckoned with under almost any conditions. She won the first few races of the season with only Ada as competitor; then she won two matches out of three on the Thames, being beaten by Florinda, which beat her again in the Nore to Dover match, and also on the next two occasions upon which they met. Jullanar won the race from Dover to Ostend, but had to submit to defeat from Ada there, and also on the race back from Ostend. A new Fife yawl, Condor, took part in the Royal Ulster matches, and proved to be a dangerous rival to Jullanar, the pair indulging in some very keen racing. At the end of the season Jullanar’s record was twelve first and five second prizes, of the total value of £1,065. Florinda won ten first and two second prizes, value £736. Neptune had a total of five flags, and Condortook two firsts and one second, but she sailed in fewer matches than the others. Corisande, Ada, Diana, Ellida, Fiona, Fleur-de-lys, and Gertrude, the last named an 80-tonner, owned by Lieutenant Henn, sailed more or less frequently with the yawls. 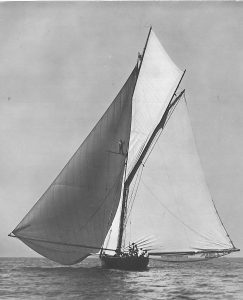 The advent of a new big cutter directed considerable attention to the sport in that class, which was regarded in some quarters as the best that had been witnessed for some years. The new cutter was Formosa, built by Ratsey for Mr. F. Sloan Stanley. Neva, the previous year’s champion, had changed hands, and with the change of ownership her luck seemed to depart, or possibly she paid the penalty of coming out in her well-worn canvas. As the result of twenty-six starts she won six first and two second prizes – a not altogether bad record, but not to be compared with that of the former season. Vol-au-Vent, Cythera, and the famous old Arrow went to complete what we might regard as the regular racing fleet of big cutters. Formosa never met the whole fleet at any one time. Her first race was from Harwich to Southend, in which she so completely smothered her opponents that it was feared that she might accomplish the same as Miranda had done with the schooners – spoil the class. She was an undoubtedly smart craft, but, fortunately for the sport, did not show her superiority to the extent of discouraging the other competitors. On the other hand, the big single-stickers had a most interesting season, and at the end of the summer there was more than one good record. Formosasecured nine first and four second prizes, while Vol-au-Vent had nine firsts and one second. The two met on fourteen occasions, and each won four first prizes, while Formosa also took one second; and in those races in which neither of the pair scored she finished ahead of Vol-au-Ventfour times, so that hers was the better record. She won the Queen’s Cup at the Squadron Regatta. Cythera took four prizes, all firsts, included in which was the Queen’s Cup at the Royal St. George Regatta. The old Arrow had, in the opinion of many, never sailed in better form. Her record only amounted to one first and two seconds, but her season had not been a long one. Neptune and Fiona sailed a few matches in the early part of the season as cutters, but did not do remarkably well, and Oimara started occasionally, but without success. Myosotis was once more at the top of the 40-ton class, and in value of prizes won was just ahead of Formosa in the big class. 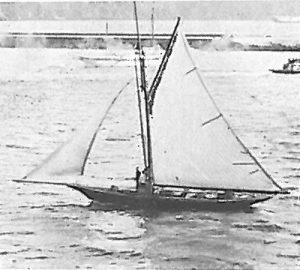 She had a full season’s racing, commencing on the Thames, where she met a new ‘forty,’ the Coryphee, built at Port Glasgow for Mr. R. Y. Richardson. Coraliewas the winner of this first race. Interest was well sustained by the ‘forties’ throughout the season. The most regular competitors were the three already named and Norman. Myosotis took fourteen first and four second prizes, and Norman was next with five firsts and four seconds. This record was better in comparison with the champion than would appear at a glance, as her races were fewer. Coryphee secured six firsts and two seconds. She was a fast boat, but was slow in stays, and this in a measure told against her success. Coralie did not race very often, but managed to secure five flags, four of which were firsts. Niobe, Glance, Christine, and Diana were outclassed by the more modern boats. Vanessa had changed owners. She flew Mr. Borwick’s flag, who in the previous year had made the remarkable record with Neva in the big class. His luck did not desert him in his change of boats, for Vanessascored no less than twenty-four wins and three second prizes. Maia, an iron vessel, had been built for the class from designs by Mr. C. P. Clayton. She took eight prizes in the season, of which three were firsts. Enriqueta’s record came next to that of Vanessa. She secured twelve first and three second prizes. Irene and Frederica sailed in the class occasionally, whilst Shulah, renamed Roberta, took a couple of prizes during the season. The Challenge had been sold to France, where she had matters all her own way in the few races she sailed. Maggie was a new 15-tonner built by Hatcher, and was a most remarkable craft. She was far and away the best of the class, and won fifteen first and two second prizes, value £268. Mabel, Cutter, 13 tons. Mr. W. S. Kelly. Florence made a splendid record in the 10-ton class, and was regarded as a wonder. She started in forty races, and took £369 in prize-money, which represented twenty-two first and five second prizes. 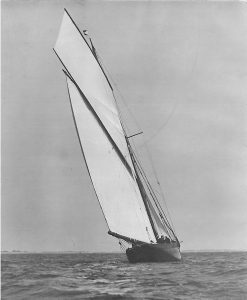 Preciosa was a new boat in the class, and came out at the end of the season with a total of eight flags; while Mildred had ten, but only three of hers were firsts, while the new craft counted five wins. Lily, Chip, and Elaine also competed in the class. Mr. W. S. Kelly’s Mabel also had a fairly good record. Amongst the same class in the North Quiraing held the best record, with sixteen firsts and four seconds, Volga being next. 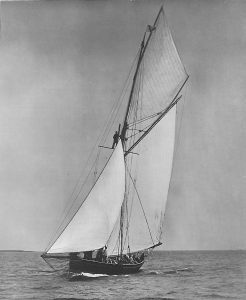 Freda, the 5-tonner, had no opponents worthy of her in the South, but up North there was some very good racing between Lorelei, Vril, Rose, Clio, and Clotilde, in which the first named came out best. ‘Latona’. Designed and built by Mr. W. Fife, sen. The summer of 1879 was cold and wet, which marred, to a certain extent, the enjoyment of the sport. As usual, there had been gloomy predictions during the early months of the year in reference to the sport, which still seemed to be estimated in a great measure by the prospects in the schooner class. The season commenced tamely so far as the two-stickers were concerned, for at the opening matches on the Thames there were none present. A new vessel of 147 tons, Fiona, had been built by Nicholson of Gosport for Mr. Boutcher, but she was not designed purely for racing. Miranda was in commission again, and Egeria and Cetonia also came out. These formed the principal racing fleet. Miranda once more headed the class, although she did not appear to be so invincible as in the preceding year. Her record was seven flags, Egeria took two firsts, including the Queen’s Cup at the Squadron Regatta. There was likewise a great falling-off in the number of yawls; but the racing was interesting, largely owing to Latona, which had been properly fitted out for racing, being a regular competitor at all the important regattas. The great regret was that the famous Jullanar was not out to meet her. Her principal competitors were the Condor and Cuckoo. Condor did not come up to the expectations which had been formed of her, and only succeeded in taking one first prize throughout the season, Cuckoo constantly beating her; while Latona made a remarkable record, which had, up to that time, only been exceeded once so far as the value of prizes was concerned. Her £1,276 represented fourteen first and four second prizes. Florinda’s flags numbered eight at the end of the summer. 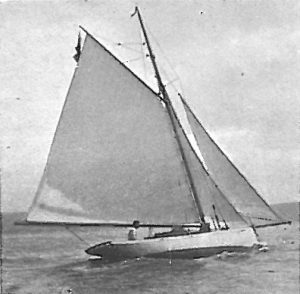 Cythera had been altered to yawl rig, but only raced a few times. Daphne, Yawl, 62 tons. Mr. W. Makant. Designed by J Elder and Co. in 1879. Alfred – of the aggregate value of £906. Daphne, a new craft, came out on the Clyde, but she did not go the complete round of regattas. The fleet of 40-tonners comprised Bloodhound, Britannia, Coryphee, and Niobe. Three of the fastest of the previous year’s boats were not in commission. Myosotis had been sold to France. The racing was, however, keen. Bloodhound was top of the class, her score being fourteen first and two second prizes, value £680; while Britannia was next with five firsts and eleven seconds, value £477. Coryphee was third, her record being eight firsts and four seconds; and Niobe next with £142, representing four first and two second prizes. There were three additions to the 20-ton class: Sayonara, built at Port Glasgow for Mr. G. Richardson; Louise, built at Payne’s for Mr. Atkins; and Viola, built by Ratsey for Mr. Kelly. Vanessa came out again, but with a very poor fit-out of canvas, which destroyed her chances in fair weather, although on some wet and windy days she gave glimpses of her old form. Sayonara topped the prize-list with eighteen flags, Enriquetabeing close to her, with only a difference of two second prizes, her record being thirteen first and three second. Louise had ten prizes to her credit, and there were many who professed the belief that she was a better boat than her record suggested. Maggie remained invincible in the 15-ton class. Madge, a new Clyde 10-tonner, made a remarkable record. She took a prize for every one of her twenty-four starts, twenty-two of them being wins. Maharanee, of the same tonnage, was built in the South, and her performances when meeting Quiraing im­pressed some with the belief that she was little, if any, inferior to Madge. Her record was six prizes, while Quiraing secured twelve. Florence, in the same class, had the excellent record of fifteen firsts and three seconds. The 10-tonners, in addition to those already referred to, included Merle, Verve, Lily, Juliet, Mabel, and Elaine. The sport amongst the 5-tonners showed most life on the Clyde, where Cyprus was easily the best of the fleet, her score of prizes being ten first and one second. Lorelei only sailed in a few matches. Freda had once again things all her own way in the South. A new class of 3-ton craft was started on the Clyde. This year the Yacht Racing Association decided to take the measurement of length on the waterline, instead of between per­pendiculars on deck. Waterwitch, Schooner, 160 tons. Designed and built by Messr. Camper and Nicholson in 1880. Nicandra, ex Vanduara, 90-tonner. Designed by Mr. G. L. Watson in 1880. Owned by Mr. John Ferguson. The summer of this year was a fine one, and the racing was thoroughly successful, even though some of the classes were not in such strength as in some former years. An addition was made to the schooners in Waterwitch, a 100 60-ton vessel built for Mr. E. C. Baring by Nicholson. She possessed a good turn of speed, but only succeeded in taking one prize during the season. Miranda was once more at the head of the class, having things pretty well her own way. Pantomime started the season in English waters, and promised to give the Miranda some sport, but she only sailed in a few of the early matches. Miranda was the only one that was able to fly a respectable string of flags at the end of the season. Her record was nine first, two second, and three third prizes; while Cetonia came next, with three firsts and one second. There were several smaller schooners which sailed occasionally. Samoena. Owned by Mr. John Jamieson. in Samœna, which was a faster boat off the wind. The Prince of Wales had bought the Formosa, and with Arrow in commission and the Cuckoo once more in cutter rig, there was a fine class of big cutters, although the whole five never met all at one time. Vanduara commenced her racing at the opening matches on the Thames. Mr. Jameson’s cutter Samœna began her career in Ireland, and it was there that the two first met, and commenced that long series of battles which will ever remain famous in the annals of yachting. At the end of the season, Vanduara flew eighteen flags, representing thirteen first, two second, and three third prizes. Samœna’s record was eleven firsts and five seconds, while in money value she was a few pounds better than Vanduara, both being over £1,000. Formosa won three prizes in all, including the Queen’s Cup at the Royal Squadron Regatta. There was a goodly number of yawls in commission. Latona commenced the season in excellent form, but Florinda came out a much improved boat after alterations, and the two were very evenly matched during the remainder of the season, and at the end there was little to choose between them. Latona’s record was eight first and six second prizes, while Florinda had eight firsts and four seconds to her credit. Latona won two Queen’s Cups – one in the Nore to Dover race and the other at the Royal Ulster Regatta. Freda, 20-Tonner. Designed by Mr. D. Hatcher. There were no new cutters in the 40-ton class, but Norman came out with an increased sail-spread, and was greatly superior to all her competitors, finishing the year with a string of twenty flags. The fleet of 20-tonners received an addition in Freda, built for Mr. T. G. Freke. She proved immensely superior to the whole of the rest of the class, and flew twenty-one flags at the finish of the season. Prizes were fairly evenly divided between the others in the class. Maggie, for want of competitors in her proper class, the 15-tonners, sailed with the twenties, and had the very excellent record of eleven first and nine second prizes as the result of her season’s racing. There was no 10-ton class in the South, but Mr. Coats sent Madge down to try conclusions with Maharanee, some fine racing resulting. On the Clyde, Madge’s principal opponent was the Neptune. Chief honours for the season rested with Madge, which secured twenty-six prizes in all. The 5-ton Nora was built this season for Mr. R. G. Allan, from designs by Mr. G. L. Watson, and proved more than a match for the rest of the class. The season of 1881 was comparatively uneventful so far as the large class was concerned. Samœna headed the list of prize­winners with the then unprecedented sum of £1,504 to her credit, having won sixteen first and seven second prizes. She only met Vanduara on five occasions, beating her four times. The 60-tonner Daphne, which had been altered in the winter, won five prizes from Samœna. Of the large yawls, Latona and Florinda were the only competitors, the former winning five of six races in which they engaged. ‘Annasona’, Cutter, 40 tons. Major A. Bogle, late R.E. Designed by Mr. W. Fife Jun., in 1881. The class of the season was formed by the 40-tonners, of which there were three new vessels, Sleuthhound and Annasona, both built and designed by Fife, the former for the Marquis of Ailsa and the latter for Mr. J. Hedderwick, and May, designed by Mr. G. L. Watson for Mr. N. B. Stewart. Great interest was centred in the class. May was the first to make her appearance, and had no diffi­culty in disposing of Norman. The three were much faster than the older vessels, and Annasona proved rather the best. She won fourteen first and two second prizes, whilst May won twelve firsts and two seconds, though she started in five more races. Sleuthhound, which started most frequently, won only two firsts and six seconds. All three yachts were of narrower beam and greater displacement than Norman. May, 20 tons. Designed by Mr. G. L. Watson in 1882. Buttercup, 10-tonner. Designed, owned and raced by Mr. Robert Hewlet in 1881.
having purchased her. The racing of this class was excellent, Freda heading the list with seventeen first prizes out of thirty-two starts, Amethea taking thirteen firsts in twenty-nine starts, and Louise six firsts. A sensation was caused in the 10-ton class by the advent of Buttercup, built for Mr. R. Hewett. She had a lead keel of no less than 14 tons. She was the first cutter built with a fiddle bow. In the South she was easily the best of her class, proving faster on the wind in a hard breeze than the 15-ton Maggie. In the North, Mr. G. L. Watson designed a new boat for Mr. W. Wylie, who named her Verve, and Mr. Fife built a new yacht, Neptune, for Mr. J. S. Stewart. These, however, did not meet Buttercup, which won fifteen first prizes. Neptune won seventeen first prizes and Verve five. 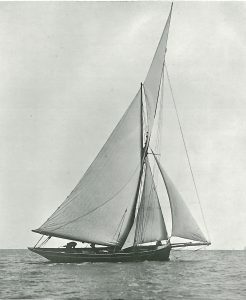 Nora still held the lead in the 5-ton class, though Cocker, designed by the Marquis of Ailsa, and Cyprus, designed by Mr. W. Fife, jun., were new boats in the class. Nora won twelve firsts and four seconds, Cyprus four firsts and four seconds, and Cocker two firsts and five seconds.